Chrichton's World: Review Soldier Boyz (1995): Dirty Dozen heroic bloodshed style! 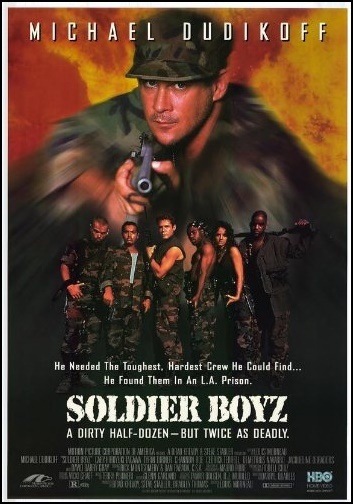 Review Soldier Boyz (1995): Dirty Dozen heroic bloodshed style! Soldier Boyz is about Major Howard Toliver played by Michael Dudikoff who suddenly feels compelled to recruit 6 teenage prisoners for a special mission. Probably because he thinks it will teach them a lesson. The whole premise obviously is taken from The Dirty Dozen with three major differences. The teenagers might be criminal but they clearly are lightweight compared to the prisoners in the classic. Second, their age. Who in their right mind would ever approve these kids, criminal or not, to be put on such a mission? Third, the teens aren't soldiers. They have no training whatsoever. Some of them are proficient enough because of their gangbanging past but come on. You might have guessed it, the premise is totally ridiculous. However, if you can manage to get past this you will be able to enjoy Soldier Boyz. Why? Because it does offer good choreographed action and the right context to make the action more exciting. Director Louis Morneau might not be a big name but he knows what matters in action flicks like this. He is aware that there is very little to no point to tell a complicated story. First and foremost, it's the action that counts and everything else should be in service of that action. Morneau does exactly this. It's my guess he must be a big fan of Hong Kong cinema or at least John Woo because he has implemented some of his style and choreography. It's far from perfect but surprisingly effective since it's fun to watch. It does look like some bucks have been spent on the action sequences to make them look good. For some reason there is a lot of hate towards this film. I understand that the premise is over the top and borderline ludicrous. But this is a B movie and it doesn't pretend to be more than an action film. Everything is in service of the action. It does exactly what it is supposed to. Granted it rushes through characterization and story. But how many films get bogged down by those elements? The direction is so competently done that you still become invested in Dudikoff's team and their task. The group of actors also roll with the plot like it's Shakespeare and do their best to sell you the plot. One of them is so gangsta that he holds and shoots his guns sideways. If he had received proper military training that would have never been allowed. But isn't that the ultimate expression of defiance towards the man? There is a character nicknamed monster who most likely has mental issues. Another example of the US government doing a poor job taking care of their own. They even included a girl who demonstrates to be just as capable or even more so to get the job done. It's not much but there is enough there to breathe life into basically canon fodder. And believe it or not this is one of the best films Michael Dudikoff has starred in. He is as competent as ever. So what more do you want? My advice to just roll with the premise and you will find enjoyment with this very competently made little action flick.